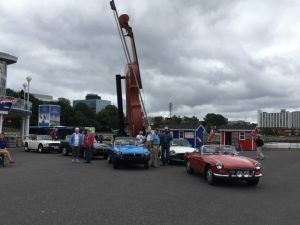 Under grey skies & comfortable temperatures, 7 of our Club’s British cars ( Sunbeam Alpine, TR6, 4 MGB’s, Morgan ), arrived at the Joan Harris Cruise Pavilion to welcome passengers from the Veendam. The morning passed quickly, talking to passengers mainly from the U.S., many who had owned or knew of these cars, shared their stories & vice versa. After a lovely lunch, Club members left with their cars as they came, as onlookers waved, took pictures & smiled. It was another successful visit dockside for the BCCCB. A cool day but warm greetings awaited the passengers from the Zuiderdam, Albatross & Veendam. 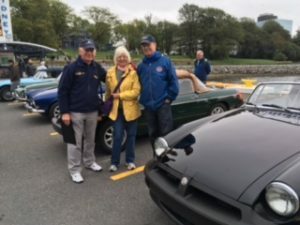 As the morning moved along, the wind came up but the showers held off much to the delight of the BCCCB owners who showed up with 4 MGB’s, a Sunbeam Alpine, & a Jensen. 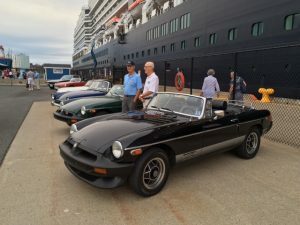 As the Veendam arrived dockside & passengers disembarked, many were very excited to see the cars. Pictures were taken and stories shared. It’s great to see how much interest these cars generate among the passengers & crew. Our next visit will be in October when we will see the arrival of 3 ships, two of which will be under British Registry. 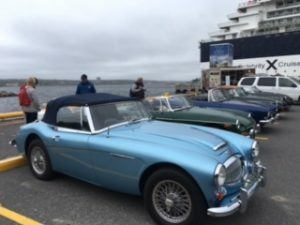 Several BCCCB members arrived mid-morning to show their cars to the delight of many passengers aboard two British registered ships, the Aurora and Queen Mary 2, as well as, the Celebrity Summit. Our BCCCB car line-up included three MGB’s, a Sunbeam and an Austin Healey. The cars were strategically parked near the Boardwalk which allowed easy access for passengers. Many stories were told and as always, a lot of excitement created as passengers and owners shared their passion for British cars. 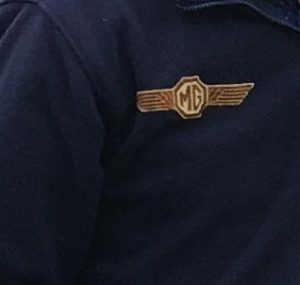 One enthusiast from the Queen Mary 2, proudly wearing the British MG logo on his jacket, talked about the number of cars he had over time and the Austin Healey he currently owns. Another great visit was experienced by the BCCCB at dockside for Car for Cruisers, wrapping up this event for the 2018 season.